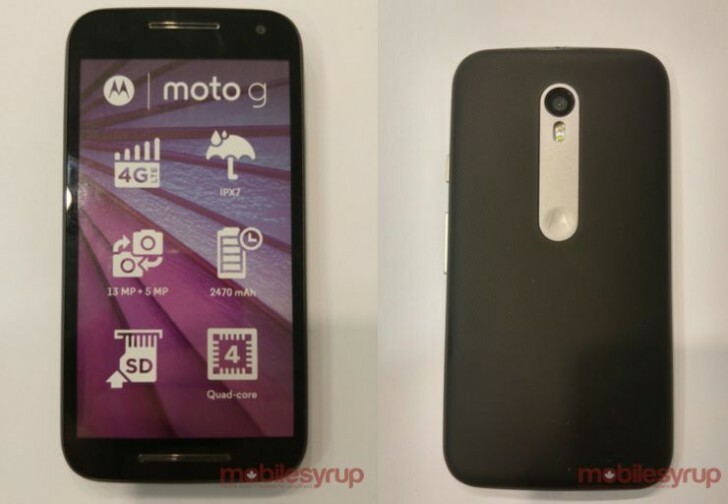 By now most of you already know what the 2015 Moto G will look like , but just when you thought the torrent of Moto G leaks were over , a new one has popped up showing what appears to be one of the official press renders of the device .The Moto G 2015 – which is rumored to come in two flavors – one a sub $179 GSM only variant and a more expensive $229-249 phone with some good specs and LTE .The basic model of the phone is said to pack a weaker Snapdragon 410 Soc and 2GB of RAM ,8GB of storage +MicroSD expansion and a 2470mAh battery with the same 5″ 720p IPS display derived from the second gen Moto G .The premium model ,which is rumored to carry LTE support is a completely different animal from the basic version as it is rumored to pack a 1.7Ghz Snapdragon 610 Soc with Adreno 405 Graphics and 2GB of RAM . The display of the phone is also rumored to get a 1080p full hd upgrade while retaining the 5″ display size , as for the other specs , the spec sheet is a bit of a mirror of the Snapdragon 410 so you wont miss out much . The LTE version will have the same 13MP rear camera with LED flash and a 5MP front facing unit akin to the cheaper version . The battery is also left unchanged but we expect to see a 16GB storage option on the phone as previous Moto G’s usually reserved the 16GB version for LTE . Both models are expect to have IPx7 water resistance ratings meaning the devices will work even after a submersion of 1m of water for 30 minutes , although it has a water resistance rating , the device is not dust resistant .The Moto G GSM and LTE versions are expected stick to the usual $179 – $199 – $249 price but we wont be suprised if it costs more . Both versions are expected to be unveiled at Motorola’s special July 28th event .